If you still demand a physical keyboard with your smartphone, but need Android on a budget, the new BlackBerry KEY2 LE announced at IFA 2018 today might fit the bill. Taking TCL’s generally well-received BlackBerry KEY2 and trimming it down for a more affordable price point, the new smartphone starts at under $400. Despite the price cut, you still get the essentials of what makes the BlackBerry brand still appealing. Up top, there’s a 4.5-inch 1620 x 1080 display covered in Gorilla Glass, while underneath it is TCL’s latest hardware keyboard. That has QWERTY keys that are almost 10-percent larger than those on the original BlackBerry KEYone, the company points out. It also packs the Speed Key that was launched on the KEY2. That acts as a shortcut to apps, features, and services regardless of where you are in the OS: you can hold down the Speed Key and tap any other button on the keyboard, and immediately jump to that. The fingerprint sensor is integrated into the spacebar. There’s also a dual rear camera array, combining a 13-megapixel sensor and a 5-megapixel sensor. It means the KEY2 LE still offers the portrait mode photos from the KEY2, in addition to things like phrase detection autofocus and 4K 30fps video capture. The front camera, meanwhile, clocks in at 8-megapixels and can record 1080p 30fps video. Of course, a more affordable phone has to make some sacrifices. 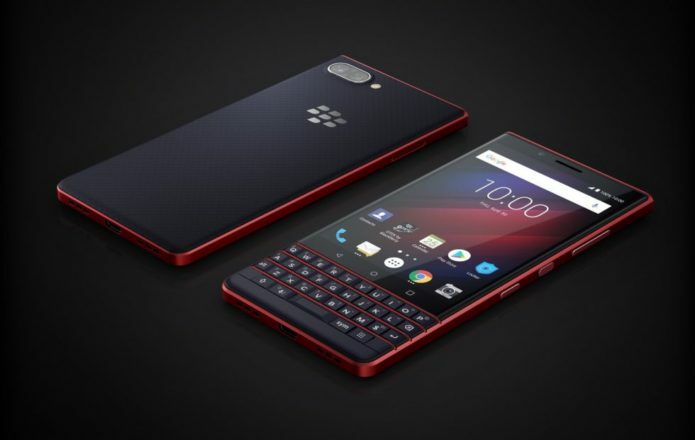 The first of those is the physical design: rather than the metal of the BlackBerry KEY2, the KEY2 LE uses polycarbonate along with a soft textured back panel. That does come with an upside, mind: at 150.25 x 71.8 x 8.35 mm and 156 grams, this is actually the thinnest and lightest entry in the KEY series so far. Inside, too, there’s been some trimming. You get a Qualcomm Snapdragon 636 chipset, slightly slower than the Snapdragon 660 in the KEY2, but more notably you also get 4 GB of RAM rather than 6 GB. There’ll be two storage options, either 32 GB or 64 GB, though either way you get a microSD card slot. 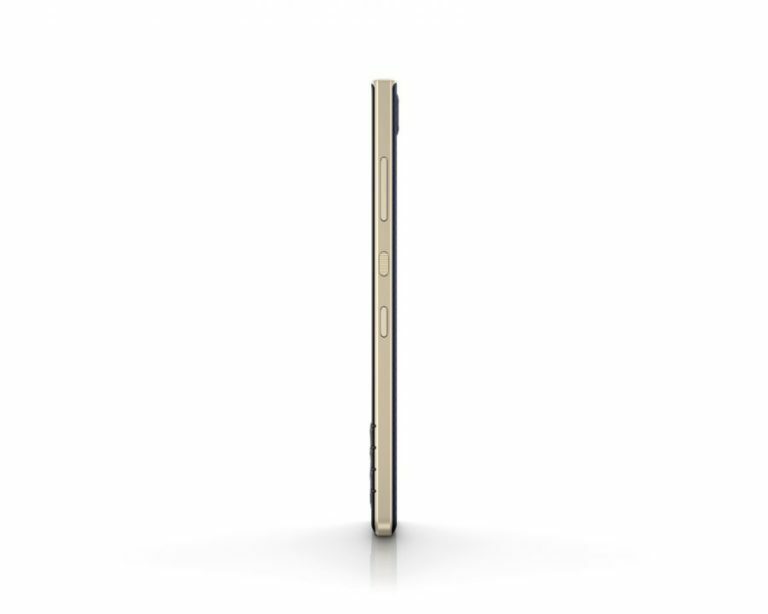 With a slimmer device, it’s no surprise that the battery has been shaved down a little too. The BlackBerry KEY2 LE gets 3,000 mAh to play with, TCL saying that should last up to 22 hours of use, along with Qualcomm Quick Charge 3.0 to get you up and running faster again. Around 36 minutes on charge is enough for up to a 50-percent top-up, apparently. Still, even with 500 mAh less than the KEY2, we’d expect the relatively conservative processor and compact display to pay dividends when it comes to the KEY2 LE’s longevity. That’s something TCL has really been acing with its KEY series, after all. The KEY2 LE will also learn from your typical usage patterns, and throw up a proactive warning to recharge in advance if you’re likely to run short later in the day. In another welcome split from the KEY2, the BlackBerry KEY2 LE will be available with some color involved. Three options will be offered at launch – a blue called Slate, a gold called Champagne, and a rather fetching red called Atomic – and end up being much more striking than the KEY2’s sober silver and black as a result. Otherwise, you get a 3.5mm headphones jack, WiFi 802.11ac, Bluetooth 5.0 LE, an FM radio, USB Type-C, and NFC. TCL’s BlackBerry preloads on top of Android 8.1 Oreo are included as well, such as the BlackBerry Hub, DTEK security suite, and various privacy aids. There’ll be single- and dual-SIM versions, too, including in the US. All in all, this is a welcome variant on the KEY2, keeping much of what made that phone popular but making it far more attainable. The BlackBerry KEY2 LE goes on sale in September, priced at $399 for the 32 GB model and $449 for the 64 GB version.